We haven’t done much with the square orbit trap so far, so let’s try to find an interesting image with this. Also, let’s try the “split by axis” region split for variety. 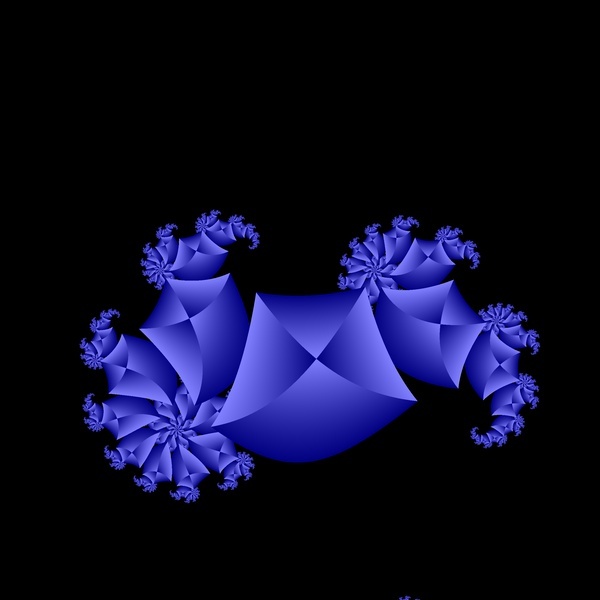 Bring up a new fractal window. Go to the Orbit parameters page and check the orbit trap box, then pick “Square” in the Trap menu and “By Axis (Real/Imag)” in the Region Split menu. Be sure to set the outer extent to 0.1 and click OK. Pick “All Black” in the Palette menu to set the background to black. Gray is not the best color for this kind of region split, so we will switch it to yellow. 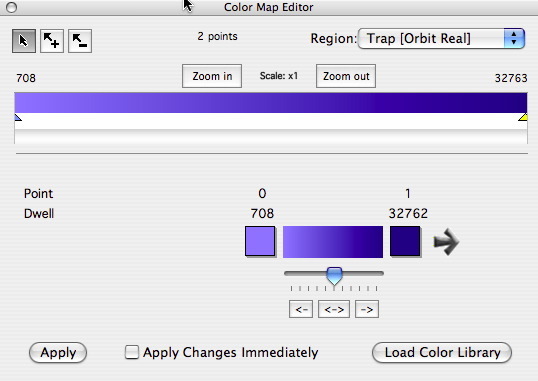 Open the Color Map Editor in the Window menu and pick “Trap [Orbit Real]” in the Region menu. Now pick “Yellow Gradient” in the Palette menu. Close the Color Map Editor. Now choose the “Preview” window in the Window menu and we will start looking. We zoom in on the upper half to see it in more detail. We go to the Orbit parameter dialog again and change the Multiple menu to “Use First Captured.” You will recall from a previous lesson that this often enhances an orbit trap image. But wait! We’re not done! 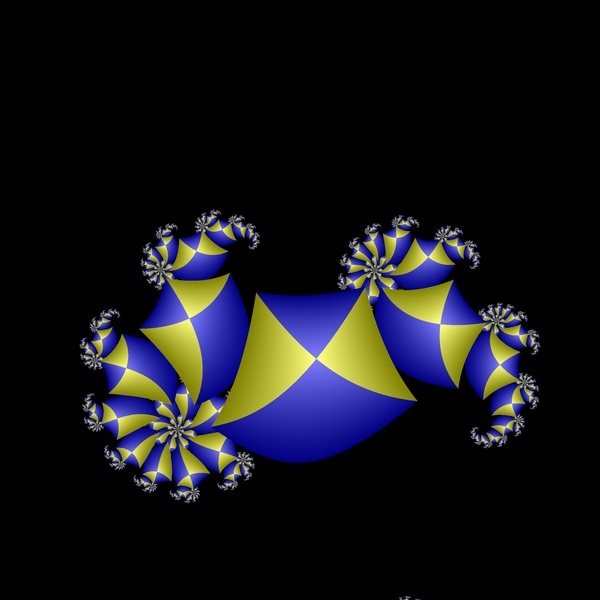 An image like this has many possibilities that can be brought out with different color maps. We will go into this in more detail in the next section, but right now let’s try a couple of simple variations that can lead to a dramatically different appearance. Bring up the color map editor window. We are going to use it to do try some variations on the region named “Trap[Orbit Real].” We aren’t even going to change the color map of the other region. The gradient reversal makes it look (to my eyes anyway) as if the square has become a three-dimensional surface, sort of like a won-ton wrapper, wrapped around on itself. 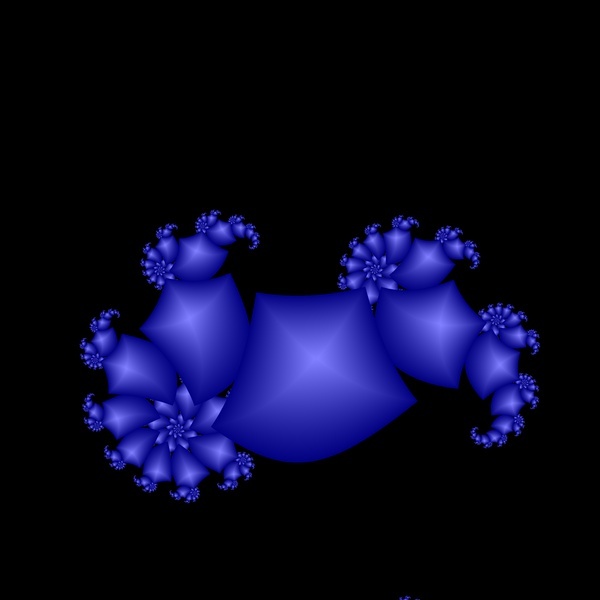 The gradient reversal trick is effective with many different region split images.